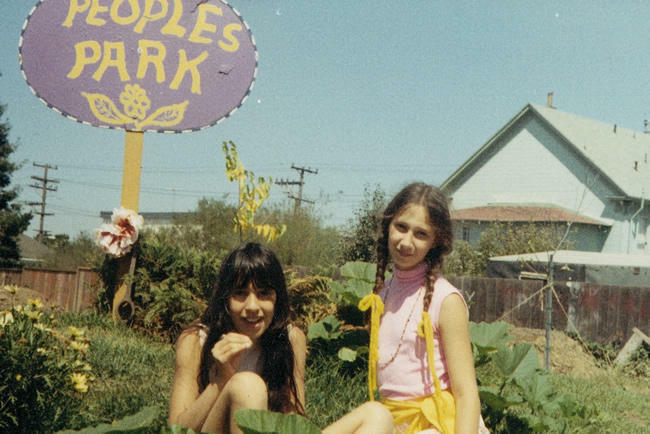 Tanya and Gabrielle in People’s Park, a hippy cooperative in Berkeley, 1968. A year-later Governor Ronald Regan sent the National Guard in with riot-gear and tear-gas. An innocent spectator was killed. On this week’s 51%, we turn to a woman who talks about her unstill life and what it was like to have a father who worked among art and artists during the heyday of Abstract Expressionism. Then we hear about a conference on women and power that for the first time will include men. In 1958, when Gabrielle Selz was a year-and-a-half old, she her parents and her sister moved to New York, where her father, Peter Selz, would begin his job as the chief curator at the Museum of Modern Art. What followed was a childhood spent among art and artists. Her memoir Unstill Life: A Daughter's Memoir Of Art And Love in The Age Of Abstraction is a window into the world of the abstract expressionist movement of the 1960s and 1970s. 51%’s Joe Donahue spoke with Gabrielle Selz about her memoir. We turn from daughter and father to, quite simply, men and women, or, perhaps not so simply. While daily headlines have been filled with stories of violence against women and girls, and a growing attack on women’s access to health-care and reproductive rights, there are also signs of progress being made toward gender equality and a greater sense of shared responsibility for the future. Omega Institute in Rhinebeck, New York, home of the Omega Women’s Leadership Center, will for the first time for its Women & Power Conference, invite men to join the stage and audience. I spoke with Carla Goldstein, co-founder of Omega Women’s Leadership Center, and Michael Kimmel, a leading researcher on men and masculinity. That was Omega Women’s Leadership Center Co-Founder Carla Goldstein and Michael Kimmel, distinguished professor of Sociology and Gender Studies at Stony Brook University in New York, where he directs the Center for the Study of Men and Masculinities. The conference, entitled Women/Men: The Next Conversation, is September 19–21 on Omega’s Rhinebeck, New York campus. In addition to Kimmel, other presenters include long distance-swimmer, Diana Nyad; historian Stephanie Coontz; media mogul Ted Turner; former Prime Minister of Australia Kevin Rudd; and singer/songwriter India.Arie.